As a well-established music festival and London street food favourite, Chapati Man are bringing their spicy Indian wraps to the rest of the UK. Having converted the muddy welly brigade of Glasto and wooed the white collars of the City of London, Chapati Man is ready to take on other major cities in the UK with their franchise branch of the business. Chapati Man, created back in 2007 by husband and wife team, Chris and Andrea Rai, the idea came from Chris taking left-over curry in a wrap to work. Their love of music festivals inspired them to share with other party-goers, the authentic curry recipes Chris grew up with; still being made by Chris’s mother Martha – and the Chapati Man brand was born! After eleven booming, successful years, Chris and Andrea now see a natural transition from a single trailer to a ‘herd’ of franchised Chapati Man trucks. Having extended their fan base from all the major UK music festivals, the London street food scene and into the chiller shelves of major multiples such as Morrisons and Waitrose, they feel its the right time to bring their freshly prepared ‘festival-style’ wraps to the rest of UK civvy street. “Yeah, our vision was always to change the way we eat Indian food in the UK from a sit-down meal to tasty, hot and easy-to-handle fresh food on the go or at your desk”. Consumer eating habits are changing as a result of working patterns and a shift towards all day snacking has been seen. This, together with a growth in interest and demand for global flavours and influences, means Chapati Man’s authentic Indian wraps meet the modern consumer need. “and now we’ll boom the rest of the UK too”. With such heritage-inspired authentic recipes and a solid track record to date we have to agree – it’s hard to see why not. 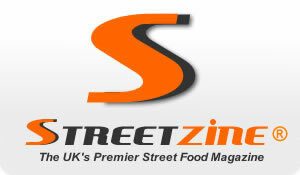 Chapati Man is a regular pop-up on the network of London locations run by street food trading platform StreetDots. Chapati Man have been working with The Franchise Company, a specialist franchise consultancy who have helped franchises throughout the UK and abroad over the last 27 years.